Your Mt Rainier journey begins with pickup at your hotel in the SeaTac or Seattle area by coach bus or sprinter van. Enjoy a scenic drive, with your expert driver and guide narrating the views outside your window along the way. Admire Alder Lake, the quaint old logging town of Eatonville and historic train boxcars that have been repurposed. Take a brief break at Longmire’s visitor center to explore the museum and National Park Inn. If time permits, go on a quick hike on the Trail of Shadows. Then get your camera ready for a photo op at Christine Falls, before tracing the Nisqually River up to Narada Falls, a bridal veil waterfall that is taller than Niagara. Then comes the best part: the views at Paradise, at 5,400 feet (1,646 m) above sea level. Grab lunch here (own expense) and take in the stunning views on the southern slope of Mt Rainier and the valley below. Watch for Roosevelt elk, deer, black bear, marmots and the elusive red fox lurking around the mountain. You’ll then have the option to go snowshoeing and sledding, if weather conditions permit. During the summer, take in flower meadow vistas and enjoy an extra stop at Reflection Lake. 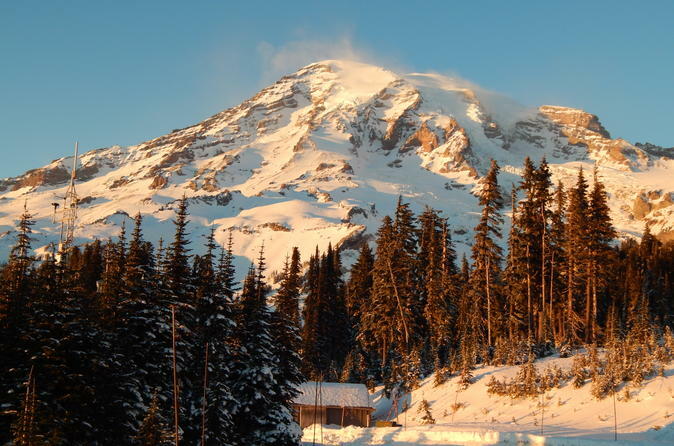 Cap off the day by learning a bit of history at the Henry M. Jackson Visitor Center, where you can read informational displays and watch a short movie about Mt Rainier, before heading back down the mountain, concluding with drop-off at your hotel. Please note: Dress in layers year-round. Wear comfortable walking shoes or snow boots. Dress for snowy conditions November–June. Paradise receives several feet of snow during the winter.